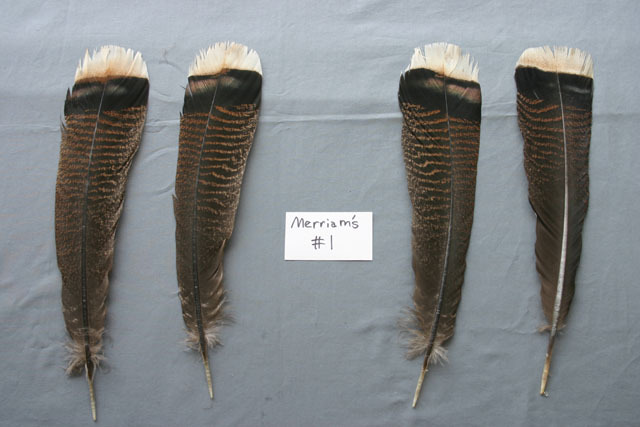 Custom Feathers is proud to offer 3 of the 5 major subspecies of turkey feathers and their tail feathers, pre-tail feathers and bronze flats which are the most identifying factors of this majestic creature. Eastern are the most common found in the United States. This turkey is present primarily from the Midwestern states all the way to the East coast. 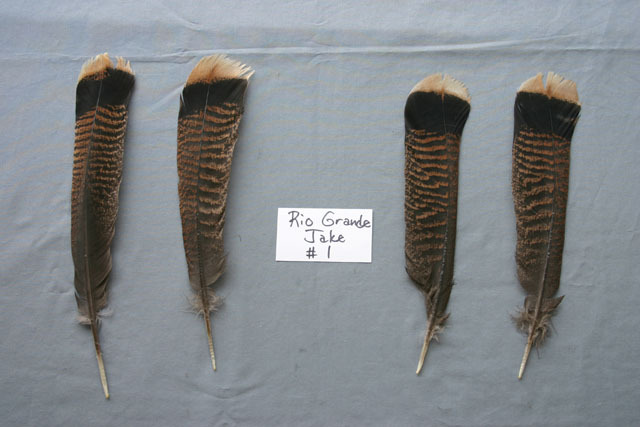 Rio Grande are located in such states as Texas, Oklahoma and Western Kansas but make their presence in small quantities in other areas as well. 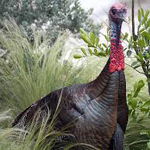 Merriam's turkeys, which were named in 1900 in honor of C. Hart Merriam, the first chief of the U.S. 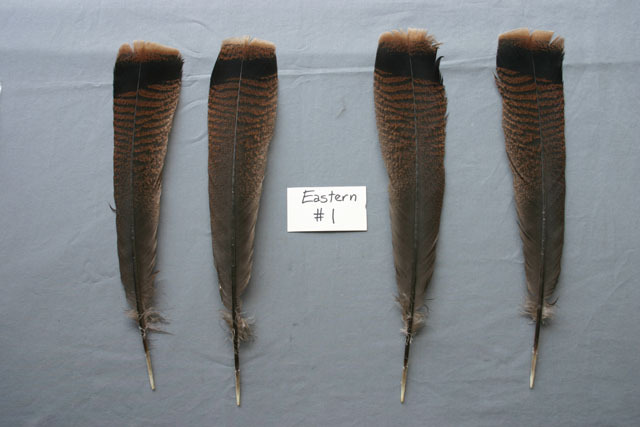 Biological Survey, are located in the upper Northwest states such as South Dakota, Montana and Wyoming but can be seen in smaller pockets all over the Western U.S. Eastern will have cinnamon to chocolate brown tipped feathers. 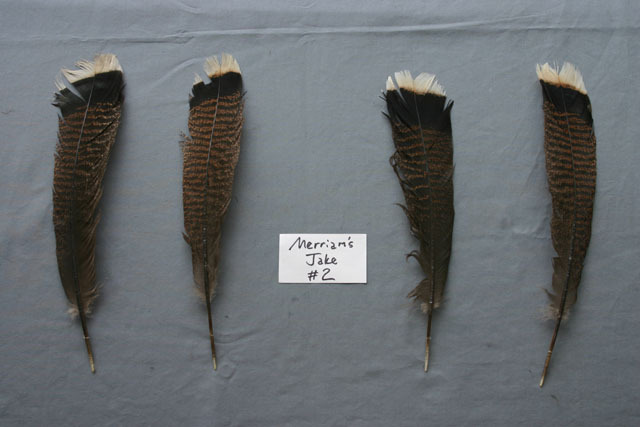 Merriam's will feature a range of blonde to platinum white tips on their feathers and the Rio Grande sub-species will be accented with caramel to sometimes blonde tips. 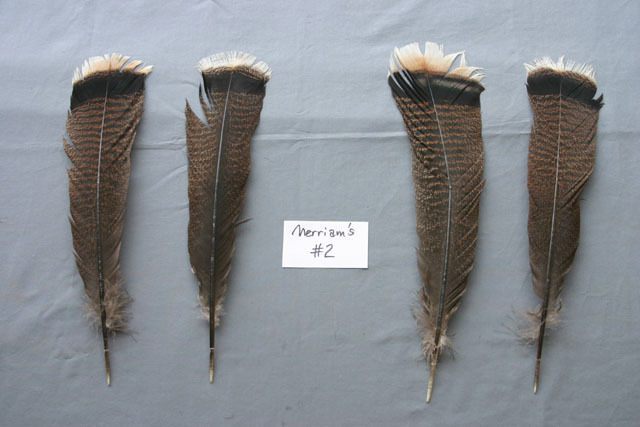 These are tail feathers from a mature gobbler also known as a tom. 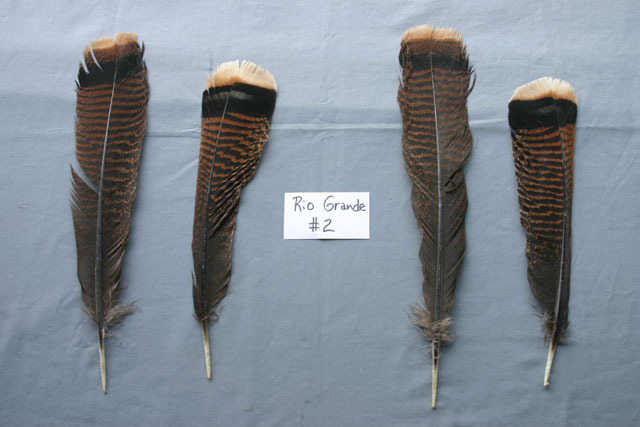 Grade #1 feathers will primarily be centers that are perfect to near perfect condition while the #2 grade will be specimens that will have minor to moderate flaws and the extreme right and left feathers from the tail. 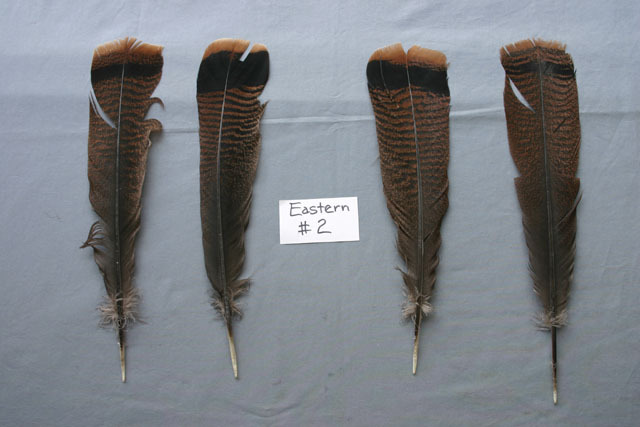 Adult tail feathers will primarily range 16-18 inches in length and 2 1/2- 3 1/2 inches in width. 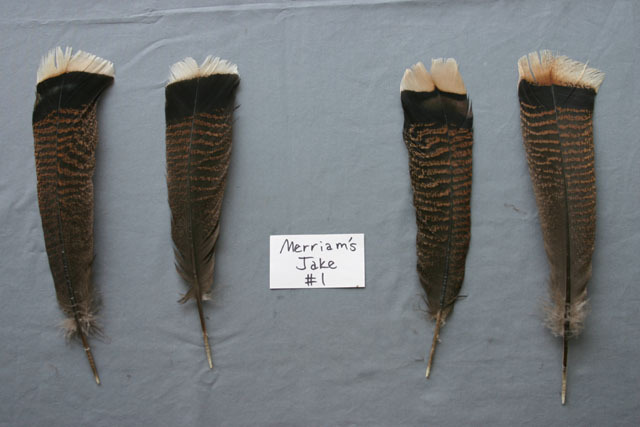 There are many uses for tail feathers ranging from making wreaths to a canvas for painting. 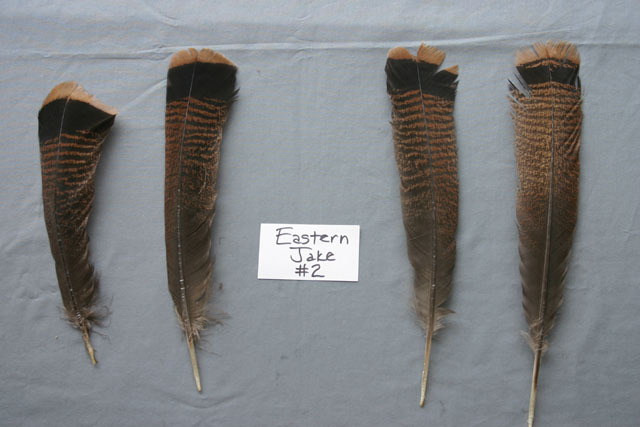 Juvenile feathers come from an immature gobbler also referred to as a jake. 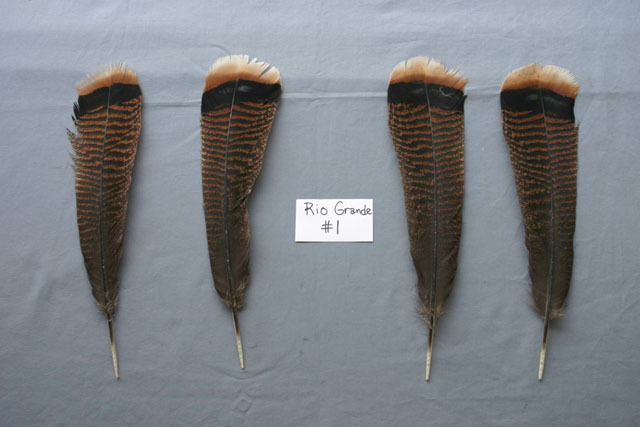 They have very delicate characteristics and are approximately 40% shorter and narrower than the adult feathers. 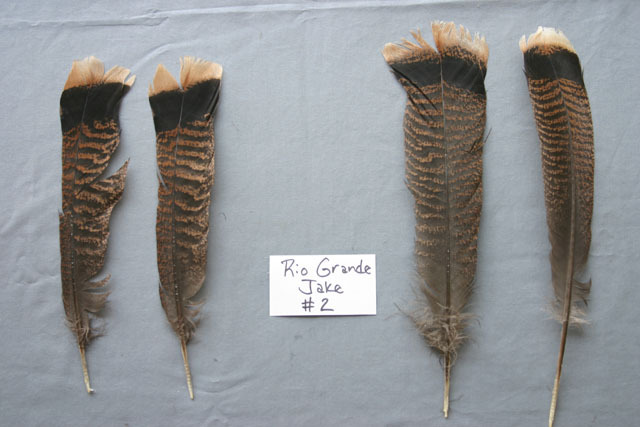 Their uses range from cleaning musical instruments to floral arrangements when a smaller feather is needed. 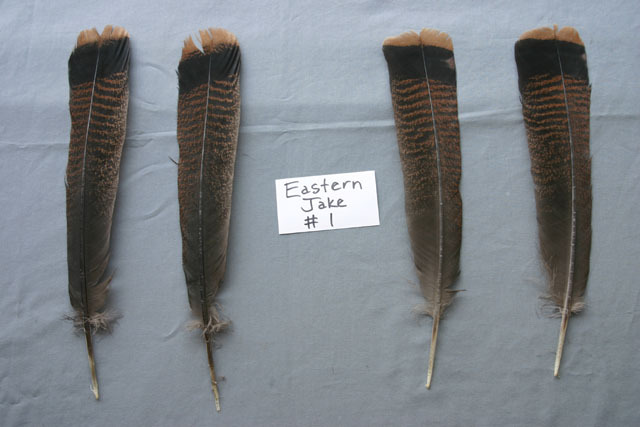 Jake tail feathers are smaller and more delicate than regular adult tail feathers since they come from juvenile turkeys. They will range from 10-16 inches in length and 1 1/4 to 2 1/4 inches in width.